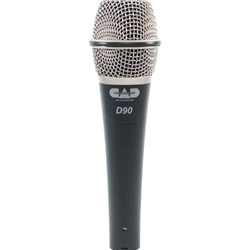 The CADLive D90 Supercardioid Dynamic Handheld Microphone from CAD is a vocal microphone outfitted with a Trueflex diaphragm and PowerGap high-gauss neodymium magnets. The microphone is suitable for use in a variety of live, touring and studio applications. Engineered for smooth articulate lead vocal performance in a durable and road ready design. The D90 is designed to outperform your expectations and deliver exceptional performance.